Getting struck by lightning is no joke. 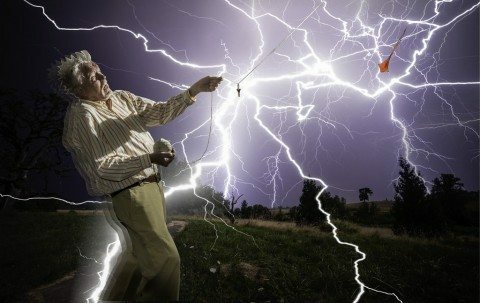 Here’s what happens when people and lightning converge. Being struck by lightning is a serious — and sometimes deadly — reality for hundreds of people in the United States each year. Don’t become a statistic. Protect yourself. That’s what Michael Utley is trying to help you do with the lightning safety website that he started after being struck by lightning. Struckbylightning.org helps you avoid the life-altering effects that each potentially deadly lightning strike can carry with it. Do seek enclosed shelter during lightning storms (even in a car). Do carry a lightning detector in case you get caught outside as a storm’s approaching. Check out this surveillance camera which shows one man being struck by lighting… twice! In case you’re wondering… Yes, you can be struck by lightning indoors! Lightning primarily travels through phone lines, plumbing, and wiring. Stay off corded phones. You can use cordless phones and wireless phones without worry during a storm. Don’t touch electrical equipment or cords. In fact, you should unplug electronic equipment before the storm arrives. Avoid all forms of plumbing. Don’t touch anything wet or filled with water. So do not wash your hands, take a shower or wash dishes during a storm. Be in the safest place in your home. For example, stay away from windows and doors, and stay off porches. Do not lie on concrete floors and do not lean against concrete walls. Following is some amazing video of tornado chasers’ extremely close calls with lightning. That is really incredible video — because you can actually see the bolt of lightning itself strike right before your very eyes. The sound it produces is outstandingly loud! Of course, some people may not think much about tornado chasers’ risk of being struck by lightning, but the truth is that being struck by lightning is a major concern any time that lightning is present. Always play it safe wth lightning. If you can hear thunder, seek a safe, enclosed shelter immediately!